Our initial ICO period was very short, just one month. Crypto market high volatility affected our ICO’s initial strong momentum. Many of our current backers are requesting that we extend the ICO and future backers are asking for more time. We need more time to finalize agreements with the exchanges. More than anyone else, we want the PARKGENE ICO to be as successful as possible and please rest assured that we will take all necessary steps to maximize the value for our backers. We are simplifying our volatility protection and for as long as Ethereum is trading below $1200. Effective immediately we will be offering a 50% bonus for all new token purchases. We feel that even in this market climate, this is a very strong incentive to join the PARKGENE ICO. We’re happy to inform you that we have reached the important milestone of 100 million GENE tokens sold. The PARKGENE project is on track and we are preparing to launch the Beta version. There are several imminent strategic partnerships which we will announce as they become final. Our roadshow has also yielded many new opportunities which we are exploring. Finally, our talks with exchanges on listing the GENE token are finalizing. We are grateful for your support and for your patience. We will continue to keep you informed of our progress. If you have any questions please contact us on our Telegram channel. PARKGENE, the world’s first shared mobility platform, blows past its sales targets during the first two weeks of its ICO. With 60 million tokens sold during the first two weeks of its ICO, PARKGENE is on track to becoming a household name in shared parking services. As anyone who drives in large cities knows well, finding parking is oftentimes not just a nightmare but, in most cases, prohibitively expensive as well. PARKGENE, the first parking booking service on the blockchain, plans to put an end to driver parking woes, with their ground-breaking peer-to-peer parking platform. PARKGENE’s aim is to become the Airbnb of the parking industry, and if the first two weeks of their public ICO is an indication, they are well on their way to making it happen. The company has already passed its pre-ICO target of selling 20 million GENE tokens during their closed round last December. After the second week of the public sale, they’ve reached 60 million tokens sold, and PARKGENE is confident they can reach their goal of 350 million tokens sold by the time the ICO ends. PARKGENE has adopted an Airbnb-like business model so that parking owners and drivers can directly interact with each other. Drivers are looking for convenient and cost-effective parking, and herein lies the problem: The parking business is a $100 billion industry globally, but it’s riddled with intermediaries taking large commissions to match drivers with parking owners. This means that drivers pay more and parking space owners make less. Airbnb originally set out to solve similar issues for travel accommodation and has certainly proven a viable model in the crowdsharing ecosystem. They have announced recently that the company will show $100 million in cash flow profitability for 2017, and is expected to launch its IPO later this year. Airbnb’s success has come at a slow burn as users have driven the home sharing app from obscurity to worldwide success over its 10-year history. There’s no doubt that the sharing economy is booming, and PARKGENE’s timing to introduce blockchain technology to the ecosystem, couldn’t’ be better. “At the moment, parking remains an inefficient industry but not for long,” says Parkgene CEO Louis Hatzis. “The parking industry will undergo major changes in the next 5-10 years as autonomous cars will need to park themselves and pay for parking. Moreover, big carmakers, namely VW and BMW, are starting to position themselves in the industry through acquisitions of regional players, and we’re seeing reports of accelerated use of mobile phone parking bookings in the US,” he adds. Hatzis believes that these are strong indicators to purchase GENE tokens today. Once the ICO is completed, PARKGENE will run an aggressive marketing campaign with the goal of making PARKGENE a household name. PARKGENE has already enjoyed successes with their existing app that has integrated 18,000 parking spots and 50,000 users in the first six months of its launch. Being the first parking booking service on the blockchain gives the company the traction to become the foremost parking booking platform in the world. Funds collected through their ICO will drive the next phase of platform development, which PARKGENE plans to expand into large cities in Greece, Britain, Russia and eventually the US, Asia and South America. Their first focus is on Athens, where they already have a presence, and then they will quickly scale to establish PARKGENE in large cities like London, Manchester, Paris, Rome, and Milan, and expand further to St. Petersburg, Moscow, Chicago, Los Angeles and New York. PARKGENE is working with ICOBox, the world’s largest provider of SaaS solutions for ICOs. The company is also the first ICO to have ever partnered with NetRoadshow, the trusted name in providing U.S. Securities & Exchange Commission (SEC) compliant online solutions for the global investment banking community, to bring in institutional backers. PARKGENE also recently appointed a new advisor, Gal Ron, a startup veteran with over 30 years of experience in forming, running, and growing companies worldwide in industries spanning from financial markets to virtual reality. He’s currently director and CEO of ConversionPros, as well as the founder of TokenTarget. Gal is passionate about the marketing and sales side of blockchain based projects, with a special interest in ICO and Post-ICO marketing and these are the areas he is collaborating actively with PARKGENE. GENE tokens are available for sale with no minimum or maximum purchase requirements and are offered at USD $0.10. 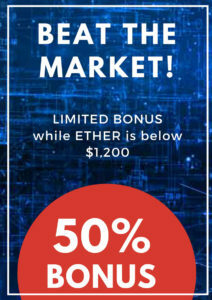 The ICO is presently in its third week, offering volume discounts and bonuses. For more information about PARKGENE, please visit https://parkgene.io. PARKGENE CEO, Ilias Hatzis and CFO Nikolas Skarlatos have been participating in several events around the world bringing the PARKGENE ICO to the Crypto community. They visited Crypto Economy ICO 2018 in London, Crypto Economy ICO 2018 in Amsterdam, d10e in the Cayman Islands, 2nd Blockchain Middle East Forum in Dubai, and will be visiting several more until the end of the ICO and beyond. The purpose of these trips has been to meet with interested parties and introduce PARKGENE to the ICO and Crypto communities. The PARKGENE executives met with Fund Managers, with partners we work with, with opinion leaders in the crypto space, with media, and with PARKGENE backers. They participated in presentations, workshops, panel discussions on legal, marketing, valuation etc. They also participated in Post ICO panel discussions, met with several exchanges and participated in several networking events. So far, the PARKGENE roadshow has been very productive and useful. We will let you know more about the PARKGENE roadshow as it continues. PARKGENE is a game-changer in shared Mobility services, with a vision to establish the GENE token as the automotive industry standard means of payment. Drivers looking for a parking spot meet virtually with parking owners through the PARKGENE app. 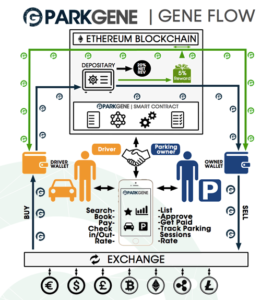 The following diagram shows the different stages of a parking session completed on the PARKGENE platform and over the Ethereum Blockchain with smart contracts. Once a driver reserves a parking spot, the reservation triggers the PARKGENE smart contract on the Ethereum Public Blockchain. The PARKGENE App transfers the full parking fee amount in GENEs from the driver wallet, to a depository (a temporary wallet). Should there not be enough GENEs balance in the driver’s wallet, the driver can use his credit card or other means of payment (Bitcoins, Ethers) to buy GENEs real-time and pay for the transaction. The successful reservation and payment provide additional App functionality to drivers and parking owners which is needed for the completion of the actual parking session. For example, the driver will have the ability to open the garage door from his mobile phone, while the parking owner is notified and monitors – in live video – the entrance and exit of the vehicle. This functionality is optional – although very helpful – and is achieved through integration of PARKGENE platform with existing remote access tools that are available in the market, or a specific device that PARKGENE will offer to the Parking Space owners at very low cost. At the end of a successful transaction the parties conclude a smart contract on Ethereum, with the entry and its confirmation on the blockchain. The parking space owners receive, from the depository to their wallet, 70-80% of smart contract in GENE tokens, when drivers check out of the parking space. The remaining: • 5% of the total amount is paid to the driver and parking space owner as they perform several actions that enhance the ecosystem (e.g. Ratings, Reviews). • 10-20% of the total amount is paid to PARKGENE to cover operational, development, cloud services and advertising costs. At any time, the users of the platform can buy or sell GENE tokens for FIAT currency (USD, EUR, JPY, CNY, etc.) or other cryptocurrency (BTC, ETH, etc) by using several cryptocurrency exchange services that may trade the GENE token (if and once GENEs may be available at such exchanges).